37837 DB cl 50 "Birthday Locomotive"
Prototype: German Federal Railroad (DB) express train for the route Frankfurt (M) Airport – Stuttgart in a special German Lufthansa paint scheme. Class 103 electric locomotive with a type Avmz 106 compartment car and two type Bpmz 296 open seating cars. Both car types have airtight construction. The train looks as it did in the summer of 1991. Model: The class 103 electric locomotive has an mfx+ digital decoder and extensive sound functions. It also has controlled high-efficiency propulsion. 3 axles powered. Traction tires. The locomotive has triple headlights and dual red marker lights that will work in conventional operation and that can be controlled digitally. The headlights at Locomotive End 2 and 1 can be turned off separately in digital operation. When the headlights at both ends are turned off, then the “Double ‚A‘ Light” function is on at both ends. The engine room lighting can be controlled digitally. The cab lighting can also be controlled digitally. Maintenance-free warm white and red LEDs are used for the lighting. The current-conducting coupler can be controlled digitally. The compartment car and open seating cars have underbody details specific to the car types. The type Avmz 106 has Fiat type Y 0270 S trucks with shock absorbers to reduce “hunting”. The type Bpmz cars have type MD trucks without generators. The cars have structural features of airtight cars such as SIG diaphragms, entry doors, and windows. All of the cars have factory-installed LED interior lighting that can be controlled from the locomotive. One car has built-in marker lights. The cars have operating current-conducting couplers. Total length over the buffers approximately 107 cm / 42-1/8“. The class 103 includes over 16 functions for the first time. World of Operation mfx+ decoder. Partially new tooling for the types Avmz and Bpmz. Types Avmz and Bpmz in the airtight version. Passenger cars with SIG diaphragms. All of the cars include factory built-in LED interior lighting that can be controlled digitally from the locomotive. Prototype: Orient Express with a Baden class IV h steam locomotive in a black paint scheme and seven teak wood cars lettered for the Compagnie Internationale des Wagons-Lits et des Grands Express Européens (CIWL). 2 each baggage cars, 4 sleeping cars, and 1 dining car. Car routing from Calais via Paris – Strasbourg – Stuttgart – Munich – Salzburg – Vienna – Budapest to Bucharest. The locomotive looks as it did starting in May of 1921 with Baden road number 1010. Model: The steam locomotive has an mfx+ digital decoder and extensive sound functions. It also has controlled high-efficiency propulsion with a flywheel, mounted in the boiler. 3 axles powered. Traction tires. A 72270 smoke unit can be installed in the locomotive. The dual headlights change over with the direction of travel. They and the smoke unit contact will work in convention operation and can be controlled digitally. Maintenance- free warm white LEDs are used for the lighting. The cars have many separately applied details and different car numbers. The set has retracted diaphragms with raised walkover plates for the end cars. The doors on the baggage cars can be opened. All of the cars have factory-installed LED interior lighting and operating current-conducting couplers. Table lights in the dining car are lit. A pickup shoe is mounted on one baggage car. A decal set with car numbers and car routing signs is included. This train set is delivered with a numbered certificate of authenticity. Length over the buffers approximately 193 cm / 76“. The cars in this train set can be found in a DC version in the Trix H0 assortment under item numbers 24793 and 24794. One-time series, only in 2015. Model: The electric locomotive is constructed of metal, has an mfx digital decoder, and extensive sound functions. It also has a special motor, centrally mounted. 4 axles powered be means of cardan shafts. Traction tires. The locomotive has triple headlights and dual red marker lights that will work in conventional operation and that can be controlled digitally. The headlights at Locomotive End 2 and 1 can be turned off separately in digital operation. When the headlights at both ends are turned off, then the “Double ‚A‘ Light” function is on at both ends. Warm white and red LEDs are used for the lighting. 2 mechanically working (not connected for catenary power) pantographs. Length over the buffers 21.8 cm / 8-9/16“. This model can be found in a DC version in the Trix H0 assortment under item number 22094. 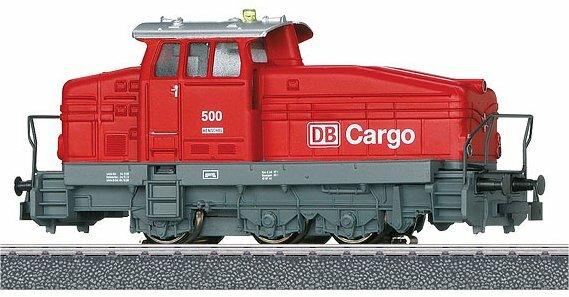 Prototype: German Railroad, Inc. (DB AG), DB Cargo Business Area, Henschel class DHG 500 diesel switch engine. Model: The locomotive has a special motor, an mfx digital decoder, and two sound functions. 1 axle powered. Traction tires. The triple headlights change over with the direction of travel, will work in conventional operation, and can be controlled digitally. There is a controllable blinking light on the cab roof. The locomotive has coupler hooks. Length over the buffers 11.2 cm / 4-3/8“. Affordable beginner‘s model with a built-in mfx decoder. Sound functions and a controllable blinking light on the cab roof. A must for any layout operated by the entire family and a great freight train with a guarantee for play and enjoyment. The humpbacked diesel switch engine with three freight cars and two model automobiles for a freight load invite you to try out things, play, and occupy your time. 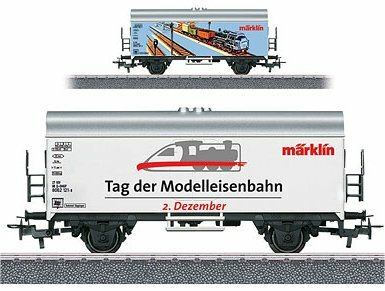 Naturally, this train can be rapidly expanded with other products from the Märklin Start up product or from the Märklin H0 program. Model: The locomotive has an mfx digital decoder and extensive sound functions. It also has a special motor, centrally mounted. 4 axles powered by means of cardan shafts. Traction tires. The locomotive has triple headlights and dual red marker lights that will work in conventional operation and that can be controlled digitally. The headlights at Locomotive End 2 and 1 can be turned off separately in digital operation. When the headlights at both ends are turned off, then the “Double ‚A‘ Light” function is on at both ends. Maintenance-free warm white and red LEDs are used for the lighting. 4 mechanically working (not connected for catenary power) pantographs. Length over the buffers 21.7 cm / 8-1/2“. Locomotive includes a new road number. • Detailed, affordable beginner‘s model with extensive features. The right locomotive to go with the 42648 express train passenger car set. The 160 km/h / 100 mph fast class E 186 TRAXX racers have done more than just conquer the high-speed route on the Dutch Railways (NS). They can also be found in upmarket express train service. The HVG V250 trains from AnsaldoBreda were actually planned for service on the Dutch HSL-Zuid high-speed route. Leased E 186 units designed for 160 km/h / 100 mph had to jump in as replacements and were used in regular schedules starting in September of 2009 on the route Amsterdam – Schiphol – Rotterdam – Breda. In the wake of successful results, current planning foresees all ICRm trains with PRIO cars with “Sandwich” motive power (one locomotive at each end of the train) with the E 186 units. At present, the NS has available 20 leased E 186 units as well as 30 units of the newly ordered E 186 001-045. Prototype: German Railroad, Inc. (DB AG) , DB Regio company area, class 640 (LINT 27) diesel powered commuter rail car. Model: The locomotive has an mfx+ digital decoder and extensive sound functions. It also has controlled high-efficiency propulsion. 4 axles powered. Traction tires. The locomotive has triple headlights and dual red marker lights that will work in conventional operation and that can be controlled digitally. Maintenance-free warm white and red LEDs are used for the lighting. The cab lighting can be controlled separately in digital operation. The cabs have interior details. The locomotive has close couplers in standard pockets with a guide mechanism. It also has separately applied grab irons. Length over the buffers 22.1 cm / 8-11/16“. mfx+ digital decoder. • Road number 120 003-9 for the first time in a metal version. This model can be found in a DC version in the Trix H0 assortment under item number 22684. Model: The locomotive has an mfx digital decoder and extensive sound functions. It also has controlled high-efficiency propulsion with a flywheel. 2 axles powered. Traction tires. The locomotive has triple headlights and dual red marker lights that will work in conventional operation and that can be controlled digitally. The lower headlights are the so-called “Stielaugen” / “Protruding Eyes”. The headlights at Locomotive End 2 and 1 can be turned off separately in digital operation. When the headlights at both ends are turned off, then the “Double ‚A‘ Light” function is on at both ends. Maintenance-free warm white and red LEDs are used for the lighting. The cabs and engine room have interior details. The locomotive has a factory-installed figure of a locomotive engineer in Cab 1. The locomotive body has numerous separately applied details. The locomotive has prototypical double arm pantographs. The locomotive frame is finely detailed with a prototypical reproduction of quill drive driving wheels. The metal buffers are separately applied in convex and flat versions. Length over the buffers 19.5 cm / 7-11/16“. An express freight baggage car set with 2 cars is being offered under item number 43993 as well as an express freight baggage car with sound under item number 43992, also exclusively for the MHI. 37837 -- DB cl 50 "Birthday Locomotive"
Prototype: German Federal Railroad (DB) class 50 freight steam locomotive, with a coal tender as the type 2´2´T26 standard design tender in its original form. Witte smoke deflectors, standard design engineer‘s cab, long running boards falling diagonally at the front by the smoke box, DB Reflex glass lanterns, bell, and an inductive magnet. Road number 50 1966. The locomotive looks as it did in 1966. Model: The locomotive has an mfx digital decoder and extensive sound functions. It also has controlled high-efficiency propulsion with a flywheel, mounted in the boiler. 5 axles powered. Traction tires. The locomotive and tender are constructed mostly of metal. A 7226 smoke generator can be installed in the locomotive. The triple headlights change over with the direction of travel. They and the smoke generator that can be installed in the locomotive will work in conventional operation and can be controlled digitally. Maintenance-free, warm white LEDs are used for the lighting. There is a permanent close coupling with a guide mechanism between the locomotive and tender that can be adjusted for the radius of the track. There is a close coupler with a guide mechanism and an NEM coupler pocket on the rear of the tender and the front of the locomotive. The minimum radius for operation is 360 mm / 14-3/16“. Piston rod protection sleeves and brake hoses are included. Length over the buffers 26.4 cm / 10-3/8”. 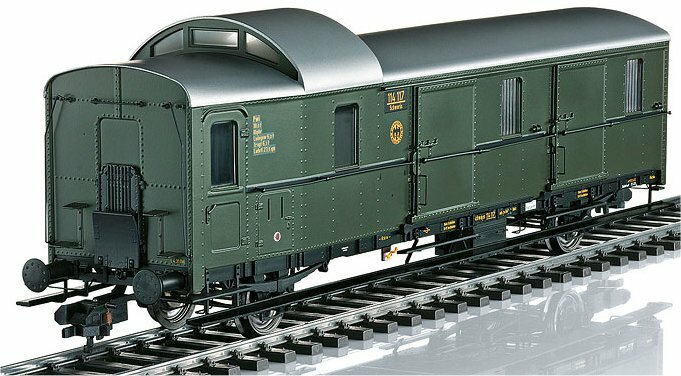 Highlights: • The special gift idea – your personal model of a class 50 for your 50th! • A high class gift package with a personalized nameplate. • Certificate of authenticity included. • Separately applied metal plates give the ordinal number of the year of your birth as well as the class number 50: 1966. The locomotive is carefully weathered by hand. The model is presented with a display case made of clear acrylic. The base has your personal nameplate made of metal with the date of your 50th birthday. Prototype: German Federal Railroad (DB) class 50 freight steam locomotive, with a coal tender as the type 2´2´T26 standard design box-style tender as it originally looked. Witte smoke deflectors, standard cab, long running boards falling diagonally at the front by the smoke box, DB Reflex glass headlights, and inductive magnet on one side included. Road number 50 2412. Use of this locomotive with a Christmas tree and a Christmas design has not been confirmed. Model: The locomotive has an mfx digital decoder and extensive sound functions. It also has controlled high-efficiency propulsion. 5 axles powered. Traction tires. The locomotive and tender are constructed mostly of metal. A 7226 smoke unit can be installed in the locomotive. The triple headlights change over with the direction of travel. They and the smoke unit that can be installed in the locomotive will work in conventional operation and can be controlled digitally. Maintenance-free warm white LEDs are used for the lighting. The special light function is a Christmas tree with LED lighting that can be controlled digitally. The locomotive whistles “O Tannenbaum” and “Jingle Bells” as a special sound function. There is a permanent close coupling with a guide mechanism between the locomotive and tender that can be adjusted for the radius of the track. The rear of the tender and the front of the locomotive have close couplers with NEM pockets and guide mechanisms. The minimum radius for operation is 360 mm / 14-3/16“. Protective piston sleeves, brake hoses are included. Length over the buffers 26.4 cm / 10-3/8”. 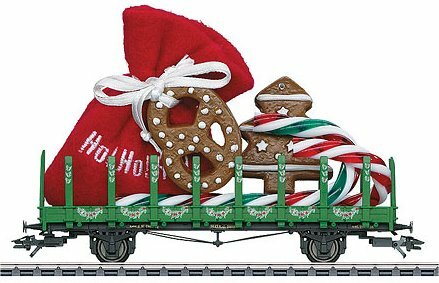 Christmas Steam Locomotive with a Tender A great gift idea for Christmas: In the Fifties and Sixties steam locomotives adorned with appropriate lettering often received their passengers at stations at Christmastime or Easter. Now there are also Christmas greetings as a genuine model steam locomotive in a clear Acrylic display case. Road number 50 2412 with its Christmas greetings and the lighted Christmas tree on the buffer beam offers a special attraction. As a special highlight, the locomotive also whistles “O Tannenbaum, ...”. SeeThis model is being presented with a display case made of clear Acrylic. The base has a metal plate with the lettering in German “Merry Christmas”. A great gift idea for Christmas: In the Fifties and Sixties steam locomotives adorned with appropriate lettering often received their passengers at stations at Christmastime or Easter. Now there are also Christmas greetings as a genuine model steam locomotive in a clear Acrylic display case. Road number 50 2412 with its Christmas greetings and the lighted Christmas tree on the buffer beam offers a special attraction. As a special highlight, the locomotive also whistles “O Tannenbaum, ...”. Prototype: German State Railroad (DRB) class 05 streamlined express steam locomotive. Version with powdered coal firing and the engineer‘s cab at the front. Deep black basic paint scheme with a white decorative stripe. Road number 05 003. Locomotive 14.555 in the delivery book for the Borsig Locomotive Works, Hennigsdorf, Germany. Model: The locomotive has the new mfx+ digital decoder and extensive sound functions. Powdered coal being moved with a compressor (Operating Sounds 1) can be activated by means of the function button. The locomotive has controlled high-efficiency propulsion with a flywheel, mounted in the boiler. 3 axles powered. Traction tires. The locomotive and tender are constructed mostly of metal. Minimum radius for operation is 360 mm / 14-3/16“. Cutouts in the side streamlining for smaller track curves can be filled in with add-on fill pieces. The dual headlights change over with the direction of travel, will work in conventional operation, and can be controlled digitally. A third headlight as a headlight for oncoming trains can be controlled separately in digital operation. The engineer‘s cab lighting can be controlled separately in digital operation. Maintenance- free, warm white LEDs are used for the lighting. The locomotive and tender have numerous, separately applied grab irons. A 7226 smoke generator can be installed on the locomotive. There is a permanent close coupling between the locomotive and tender. Length over the buffers 31.0 cm / 12-1/4”. Highlights: • “Borsig Edition 5”. • Locomotive and tender constructed mostly of metal. • A suitable collector‘s case with a relief for each model of the edition. • Excerpt from the Borsig delivery book included. A suitable collector‘s case made of wood and glass is included, and there is a relief of the characteristic Borsig gate of the Borsig Locomotive Works on the back wall of the case. An engraved metal plate including the factory number is mounted on the base of the display case. A high quality excerpt from the delivery book is included. This model is being presented with a display case made of clear Acrylic. The base has a metal plate with the lettering in German "Merry Christmas". A Christmas postcard with one of 5 themes for collecting or for sending is included. Other postcards can be found exclusively at your dealer. Prototype: 6 different Dutch Railways (NS) ICRm IC express train passenger cars, in the paint scheme HST PRIO A and HST PRIO B. Of them 4 ICRm express train passenger cars, 2nd class, and 2 ICRm express train passenger cars, 1st class. The cars look as they currently do in 2016. Model: The 7319 current-conducting coupling, the 72020/72021 operating current-conducting couplers and the 7330 lighting kit can be installed on the cars. All of the cars have different car numbers. Total length over the buffers 159.4 cm / 62-3/4“. DC wheel set E700580. 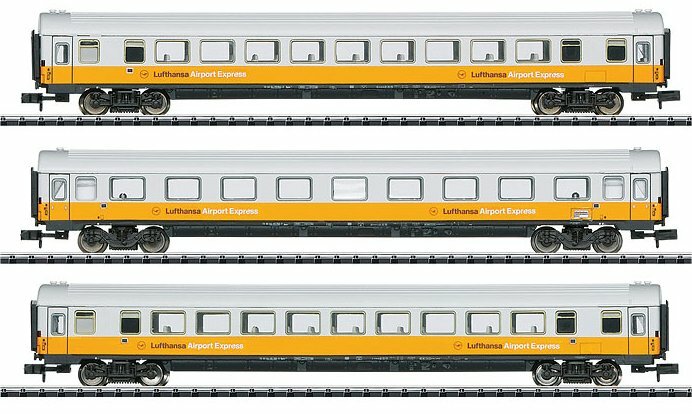 Highlights: • The express train passenger car set to go with the E 186 electric locomotive. 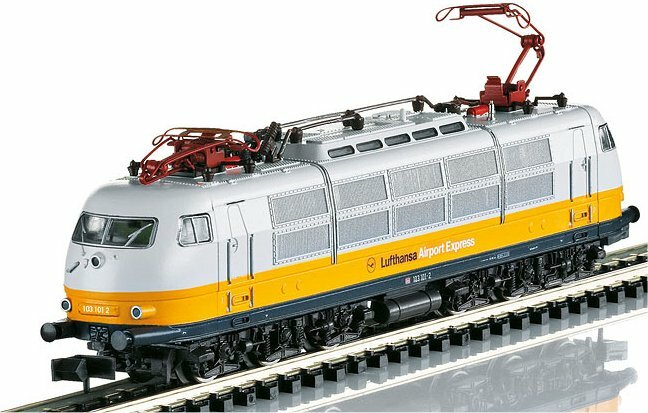 The class E 186 electric locomotive is the ideal motive power for the 42648 express train passenger car set and is available under item number 36629 that is also offered in the Märklin assortment. Prototype: 5 different design express train passenger cars of different types, paint and lettered for the German State Railroad of the GDR DDR (DR/GDR), for the Inter-Zone train D 263 Hamburg – Büchen – Hagenow Land – Schwerin – Wittenberge – Nauen – Potsdam – Doberlug-Kirchhain – Dresden. 1 type Y/B 70 passenger car with a baggage compartment, 2nd class. 2 type Y/B 70 passenger cars, 2nd class. 1 type Y/B 70 passenger car, 1st/2nd class. 1 type WR dining car. The cars look as they did around 1976/77. Model: The minimum radius for operation is 360 mm / 14-3/16“. All of the cars have imprinted train route signs. These cars are not designed for installation of interior lighting. All of the cars have different car numbers and are individually packaged. There is also a master package. Total length over the buffers 134.8 cm / 53-1/16”. Highlights: • These are the right Inter-Zone express train passenger cars to go with the class 01.5 express steam locomotive, item number 39206. • Train route D 263 from Hamburg via Schwerin, Wittenberge to Dresden. The class 01.5 express steam locomotive, item number 39206 that was new tooling in 2015 is the ideal complement to the 42980 Inter-Zone express train passenger car set. 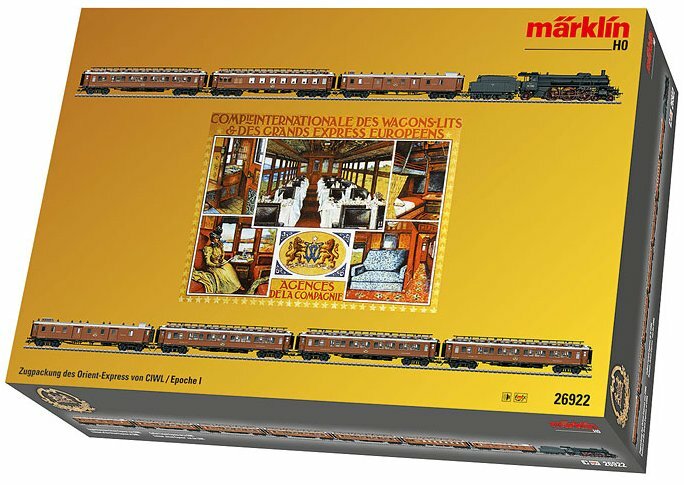 The locomotive is also being offered in the Märklin H0 assortment. Prototype: 1 German Federal Railroad (DB) type MDyge 986 auxiliary baggage car as a passenger train baggage car. Walls sheathed in sheet steel, chrome oxide green basic paint scheme. The car looks as it did at the end of the Seventies. Model: This car has an mfx digital decoder and extensive sound functions. It also has factory-installed LED interior lighting that can be controlled digitally. The car has built-in marker lights that can be controlled digitally. Warm white and red LEDs are used for the lighting. Current-conducing couplings/couplers can be used on this car. This function can be controlled digitally when current-conducting couplings/couplers are used. A pickup shoe is mounted on the car. This auxiliary baggage car has “swan neck trucks” also known as “Pennsylvania trucks”. The minimum radius for operation is 360 mm / 14-3/16“. Length over the buffers approximately 26 cm / 10-1/4”. Also included with this car: an electric cart, two carts for sacks, and 4 packages from the firm Paul M. Preiser GmbH. The functions and sounds build upon one another and give a view of a scene that could have played out at some station at this time. Imagine a late train. Freight must be loaded. The load also comes somewhat delayed to the station platform. The conductor and the load supervisor are accordingly excited. Then something goes wrong with the loading of the passengers. More power to the person who can then find a moment of quiet somewhere. Marker lights can be controlled digitally. Current-conducing couplings/couplers can be used on this car. Prototype: 2 type MDyg 986 four-axle express freight baggage cars paint- One-time series. ed and lettered for the German Federal Railroad (DB). Chrome oxide green basic paint scheme. Sidewall sheathing of sheet metal used in railroad car construction. Covered platforms at the ends of the cars, with rubber tube diaphragms. The cars look as they did at the end of the Seventies. Model: The minimum radius for operation is 360 mm / 14-3/16“. Both cars have ”swan neck trucks“ also known as ”Pennsylvania trucks“. The 7319 current-conducting couplings or the 72020/72021 operating current-conducting couplers and the 73400/73401 lighting kits along with the 73404 pickup shoe can be used on these cars. Both cars have different car numbers and are individually packaged. There is also a master package. Total length over the buffers 52.8 cm / 20-13/16”. DC wheel set E700580. 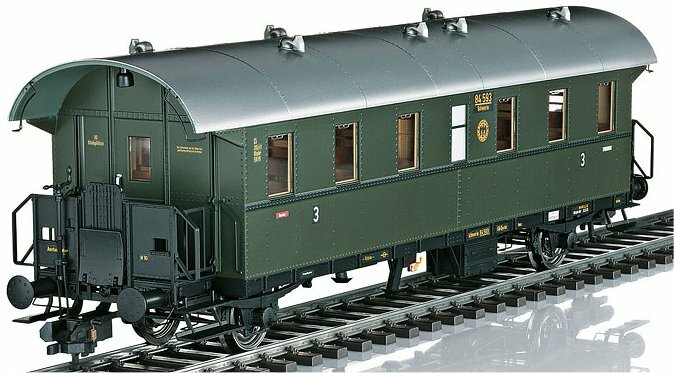 The class 118 electric locomotive, item number 37685, and another express freight baggage car with sound, item number 43992, to go with this set are also offered exclusively for the MHI in the Märklin H0 assortment. Model: The sides of the car are imprinted differnty. The car has Relex couplers. Lenght ove the buffers 11.5 cm / 4-1/2". DC wheel set E700580. Prototype: German Railroad, Inc. (DB AG) gondola, four-axle low side car, and tank car. Model: The low side car is loaded with 2 modern automobile models. The tank car has a brakeman‘s platform. All of the cars have close couplers. Total length over the buffers 39.0 cm / 15-3/8“. Model: The cars have type Y 25 welded trucks. The transport car floors are prototypically partially open and are constructed of metal with striking fish belly type side sills. Each transport car can be equipped with 6 type SR12 ExTe stakes and 3 support beams. ExTe stakes and support beams are included for mounting on each car. All of the cars have different car numbers and are packaged individually. There is also a master package. Total length over the buffers 91.5 cm / 36“. DC wheel set E700580. A DC version of these cars with other different car numbers can be found in the Trix H0 assortment under item number 24247. Highlights: • ExTe stakes and support beams are specially for transporting wood. Prototype: German Federal Railroad (DB) type E-12 Om Association Design (former Om Breslau) two-axle high-side gondola, with a brakeman‘ s platform. Fuchs type F 301 power shovel, with a high-mounted operator‘ s cab and a coal shovel. The models look as they did around 1964. 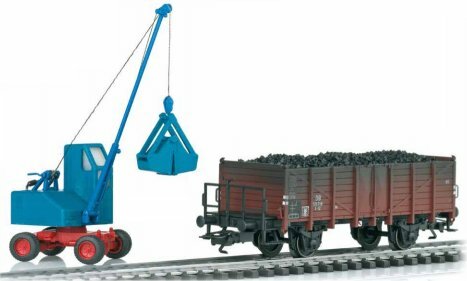 Model: The high-side gondola has a load insert of scale-sized real coal. The car is authentically weathered. Length over the buffers 11.3 cm / 4-7/16“. The model of a Fuchs power shovel with a high-mounted operator‘s cab and a coal shovel is made of a combination of metal and plastic. DC wheel set for the high-side gondola E700580. High-side gondola with a load of real coal and authentic weathering. Interesting tooling variation of the Fuchs power shovel with a high-mounted operator‘s cab. Prototype: 3 type Habbiillnss high-capacity sliding wall boxcars. Privately owned cars of the firm Wascosa, leased to the Swiss Postal System, Inc. All of the cars have different advertising designs. The cars look as they currently do in real life. Model: All of the cars have adjustable buffers and trucks. 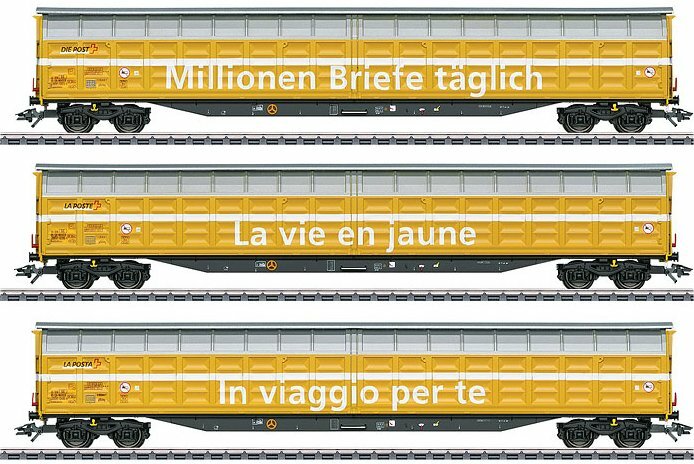 One each car in a German, a French, and an Italian advertising design. All of the cars have different car numbers and are individually packaged. There is also a master package. Length over the buffers per car 26.7 cm / 10-1/2“. DC wheel set E700580. Highlights: • Current appearance. • Attractive, striking design. Prototype: German State Railroad Company (DRG) and German Federal Railroad (DB) type R 02 stake car. Fictitious Christmas design. Model: The car has removable stakes. It also has a frame with truss rods. The car is loaded with a small felt Christmas sack. 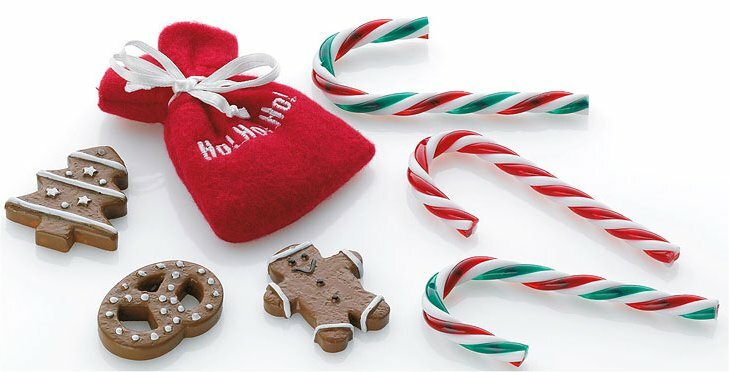 The reproductions of sugar sticks and the “Lebkuchen” figures can also be used as Christmas decorations. Length over the buffers 13.8 cm / 5-7/16“. DC wheel set E700580. Prototype: Type Eanos gondola exclusively in 2016. The Christmas car for 2016 is presented in a clear star. This can be hung on a Christmas tree with the help of the cord included with the car. There are also two laser-cut stars included with the car and they can also be hung with a string on the tree. This car continues the popular series of festive themes from previous years. One-time series only in 2016. Model: This is a funnel-flow tank car with fine, scale detailing and prototypical weathering. The car is painted and lettered for GATX. Length over the buffers 77.5 mm / 3-1/16“. Model: This is a funnel-flow tank car with fine, scale detailing and prototypical weathering. The car is painted and lettered for GATX/DHL. Length over the buffers 77.5 mm / 3-1/16“. 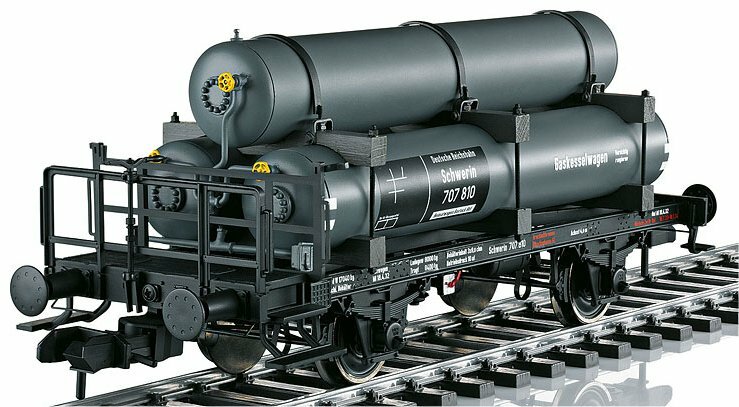 Model: This is a funnel-flow tank car with fine, scale detailing and prototypical weathering. The car is painted and lettered for Ermewa. Length over the buffers 77.5 mm / 3-1/16“. Model: This is a funnel-flow tank car with fine, scale detailing and prototypical weathering. The car is painted and lettered for Wascosa. Length over the buffers 77.5 mm / 3-1/16“. Model: This is a funnel-flow tank car with fine, scale detailing and prototypical weathering. The car is painted and lettered for VTG. Length over the buffers 77.5 mm / 3-1/16“. Prototype: German Federal Railroad (DB) class 038.10-40 steam locomotive with a tub-style tender, with Witte smoke deflectors and 2 boiler domes (steam dome, sand dome). Former Prussian P8. Model: The locomotive has a frame, superstructure, tender, and applied parts constructed mostly of metal. This is a highly detailed model with many separately applied parts and a detailed engineer‘s cab. The locomotive has an mfx digital decoder, controlled high efficiency propulsion, and a sound generator with operating sounds synchronized with the wheels as well as extensive sound functions. 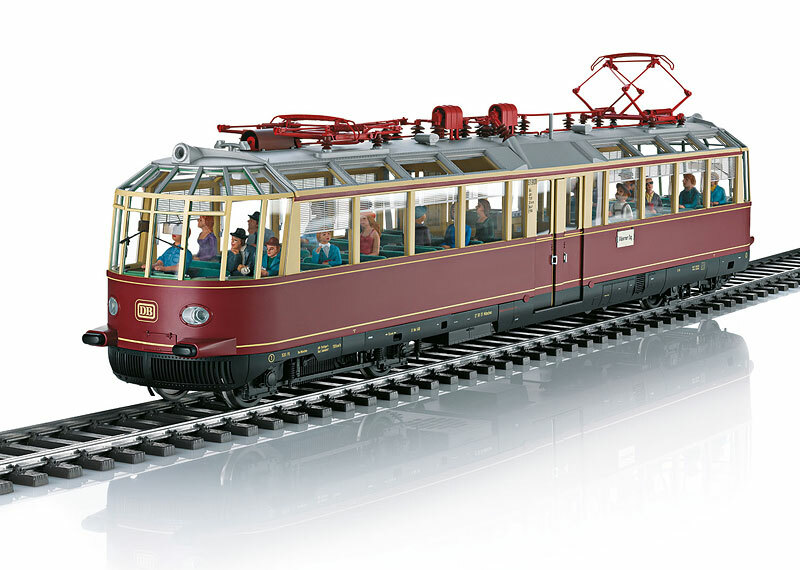 It can be operated with AC power, DC power, Märklin Digital, or DCC. 3 axles powered. The locomotive has a built-in smoke unit with smoke exhaust and cylinder steam synchronized with the wheels. The triple headlights on the locomotive and the tender have a light color correct for the era and change over with the direction of travel. The headlights and the smoke generator will work in conventional operation and can be controlled digitally. The lighting is maintenance-free, warm white LEDs. The locomotive has engine cab lights, firebox lights, and running gear lights. The special light function is a Christmas tree with LED lighting that can be controlled digitally. The locomotive whistles “ O Tannenbaum” as a special sound function. The locomotive has a reproduction of the prototype coupler on the front and a claw coupler on the rear of the tender. An accessory package with a reproduction of the prototype coupler, a claw coupler, a figure of a locomotive engineer and a fireman is included with the locomotive. Minimum radius for operation 1,020 mm / 40-3/16“. Length over the buffers 64.5 cm / 25-3/8”. Christmas tree with LED lighting that can be controlled digitally. “O Tannenbaum” steam locomotive composition. Christmas design on the locomotive and tender. Prototype: Electric prospect Railcar ET 91 01 "Glass train" of the German Railways (DB). With single lamps on the front side, air whistle on the roof and two scissor pantographs. Color purple / beige with red parapet rail and carriage run sign "Glass train". Model: metal chassis, body has finely metal / plastic construction with many separately applied details (metal handrails, wipers, air pipe, etc.). Bogies with prototypical different wheelbases. With digital decoder mfx, controlled high-efficiency propulsion, and extensive sound functions. Operating with AC power, DC power, Märklin Digital, and DCC possible. White lace and red marker lights are LEDs in conventional operation and can be controlled digitally. Factory-installed interior lighting. Interior lighting can be damped as a digital auxiliary function. Detailed interiors. Enclosed Set with 20 figures and 2 self Zuglaufschilder "special trip". On the roof two scissor pantographs. In digital mode motorized lifting and lowering the pantograph. Minimum radius 1.020 mm. Length over the buffers 64.4 cm. 20 figures and 2 more sets Zuglaufschilder "special trip" and "special trip Gläserner train-Munich" enclosed. In digital mode motorized lifting and lowering the pantograph. mfx decoder for use with a voltage, DC power, Märklin Digital, and DCC. Model: The gas tanks have separately applied parts constructed of metal and are prototypically mounted as a load unit with real wooden beams. The flat car has a brakeman‘s platform. The model has been reworked in the running gear area and is equipped with additional brake parts. Prototype couplers brake hoses are included. Length over the buffers 27.5 cm / 10-13/16“. Prototype: German State Railroad Company (DRG) type Ci-28 (83 302 Schwerin) standard design passenger car, the so-called “Donnerbüchse” / “Thunder Box”, 3rd class. The car looks as it did around 1932. Model: The car has a finely detailed frame with many separately applied parts. The car body has separate interior walls, complete interior details, separately applied roof vents, a reproduction of closed platform railings, etc. The car has built-in interior lighting. The light for the toilet can be controlled separately with a factory-installed digital decoder (also DCC capable) that can be controlled in digital operation and that will work in conventional operation. The minimum radius for operation is 1,020 mm / 40-1/8“. Prototype couplers are included. Length over the buffers 43.5 cm / 17-1/8”. Prototype: Type Gl (Glw) boxcar in the German State Railroad (DR) Association Design. Painted and lettered for Era IVa. Model: The type Gl 11 car is completely new tooling and is very finely constructed of plastic with very many separately applied details. This is the version with end reinforcements, air brakes, and without a hand brake. The doors on the model can be opened and the model has sprung buffers. The car comes with the system couplers mounted, prototype reproduction couplers, and brake hoses for installation on the car. Minimum radius for operation is 1,020 mm / 40-3/16". Length over the buffers 37.9 cm / 14-15/16". Doors that can be opened. Prototype: German State Railroad Company (DRG) type BCi-28 (36 053 Schwerin) standard design passenger car, the so-called “Donnerbüchse” / “Thunder Box”, 2nd/3rd class. The car looks as it did around 1932. Model: The car has a finely detailed frame with many separately applied parts. The car body has separate interior walls, complete interior details, separately applied roof vents, a reproduction of closed platform railings, etc. The car has built-in interior lighting. The light for the toilet can be controlled separately with a factory-installed digital decoder (also DCC capable) that can be controlled in digital operation and that will work in conventional operation. Minimum radius for operation is 1,020 mm / 40- 1/8“. Prototype couplers are included. Length over the buffers 43.5 cm / 17-1/8”. Prototype: German State Railroad Company (DRG) type Pwi-23 (114 117 Schwerin) standard design baggage car, the so-called “Donnerbüchse” / “Thunder Box”. The car looks as it did around 1932. Model: The car has a finely detailed frame with many separately applied parts. The car body has separate interior walls, complete interior details, separately applied roof vents, a reproduction of a car type with long running boards, etc. The car has built-in interior lighting. The light for the toilet and the light for the vestibule can be controlled separately. The car‘s lighting can be controlled digitally with a factory-installed digital decoder (also DCC capable) that can be controlled in digital operation and that will work in conventional operation. The minimum radius for operation is 1,020 mm / 40-1/8“. Prototype couplers are included. Length over the buffers 43.5 cm / 17-1/8”. T15707 -- Historic Dining Car for "100 Years of MITROPA"